PUSH Persevere Until Success Happens through Prayer is not the typical book on encouragement. Using the metaphor of pregnancy, the book discusses persevering from the birth of a dream to its delivery. Cindy Trimm utilizes many resources to articulate her point and although not all of them are from Christian sources, she does a good job of balancing biblical perspectives. An inspiring quote from the book says, “The important thing to remember is that every person has been endowed with a seed of greatness. Each person holds the seeds of an answer, a solution, a message, or a gift – a special assignment involving some kind of delivery” (pg. 37). Ms. Trimm uses many wonderful stories in the book that are not only thought provoking, but make a powerful impact including those about Charles Schultz, the rock and a conversation with God, and the Golden Gate bridge. In another portion of the book, Ms. Trimm talks about how women’s roles in history are so affected even now. She says, “In spite of all these factors, however, the strength of a woman is incredible. Women are resilient and have always affected the fate of nations. You will find that where women are disempowered and oppressed a weak and underdeveloped nation will be present, and where women are strengthened and empowered a strong and powerful nation will be there. (pg. 102). Ms. Trimm works through the physical manifestations of pregnancy and incorporates those same physical attributes to the dreams and purposes of a Christian. The book even draws references to science and the mind. Throughout the book, Ms. Trimm uses such excellent stories to drive home the point of each chapter. She discusses not only the internal factors of accomplishing a dream as in motivation, desire, and hard work but external factors like relationships and circumstances. An awesome quote by Maya Angelou says, “Life is not measured by the number of breaths we take, but by the moments that take our breath away” (pg. 206). What a beautiful example of pushing through to see dreams come to life. 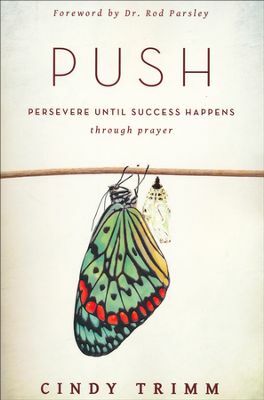 PUSH Persevere Until Success Happens through Prayer is a great book that not only encourages dreams but step by step, helps the reader to see beyond their imagination and making the dream a reality.